Of all of Christie's fictional detectives, her Belgian crime-solver Hercule Poirot is my most beloved. (Yes, I do have a painting of Poirot, Mrs. Marple, and Sherlock Holmes in my office.) While I hope to read all of her books someday, my current goal is to work through her 38 Poirot novels, of which I'm about half finished. Imagine my delight when author Sophie Hannah gained Christie's estate's permission to carry on with our beloved character by writing new mysteries for audiences to enjoy. Her first installment, The Monogram Murders, came out in 2014 and quickly became a bestseller. William Morrow Books (thank you!) 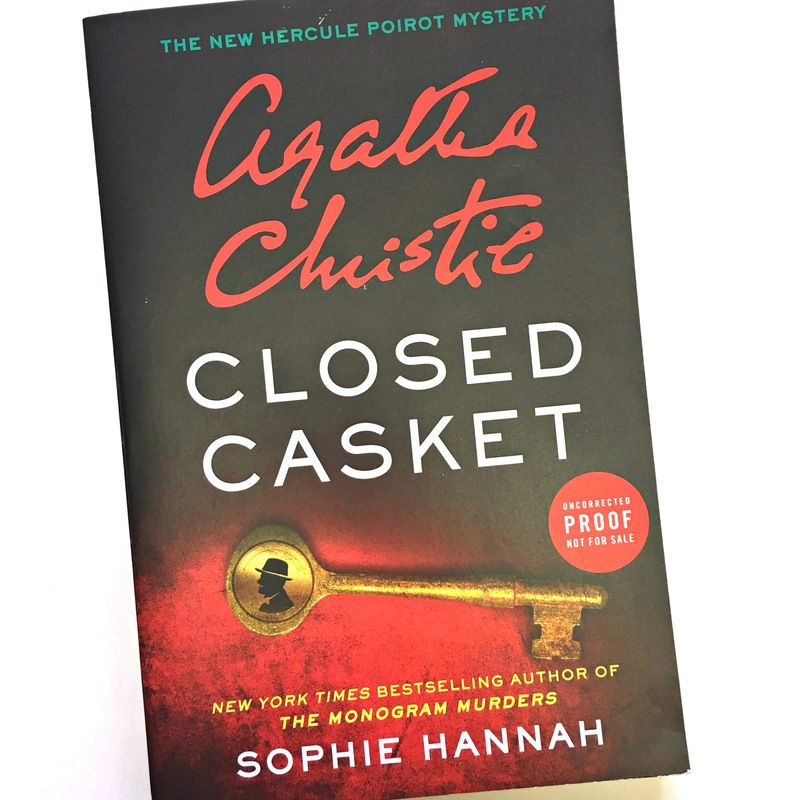 just sent me an advanced copy of Hannah's second Hercule Poirot installment, Closed Casket, which will officially hit bookshelves in September. With these words, Lady Athelinda Playford--one of the world's most beloved children's authors--springs a surprise on the lawyer entrusted with her will. As guests arrive for a party at her Irish mansion, Lady Playford has decided to cut off her two children without a penny...and leave her vast fortune to someone else: an invalid who has only weeks to live. Among Lady Playford's visitors are two strangers: the famous Belgian detective Hercule Poirot, and Inspector Edward Catchpool of Scotland Yard. Neither knows why he has been invited--until Poirot begins to wonder if Lady Playford expects a murder. But why does she seem so determined to provoke a killer? And why--when the crime is committed despite Poirot's best efforts to stop it--does the identity of the victim make no sense at all?" Intrigue! I admit that having an advanced copy of the book and the answer to the secret within my hands is really fun. It's definitely one of my favorite benefits from running this blog. Though I'm not allowed to quote from the proof copy, I can tell you that Hannah manages to capture Christie's tone from the first sentence as she draws you into the tale. Are you an Agatha Christie and Sophie Hannah fan? Which Christie novel is your favorite?